I know I shouldn't drive all night, but sometimes it happens. And it really messes up keeping track of the days. I guess it's a combination of heat (I'm not used to so much prolonged heat, and my car has no air conditioning), and driving way too many hours without stopping--trying to see as many things as possible in a limited amount of time. Doubt if I'll ever get a chance to do this again, so I want to see & do as much as possible. 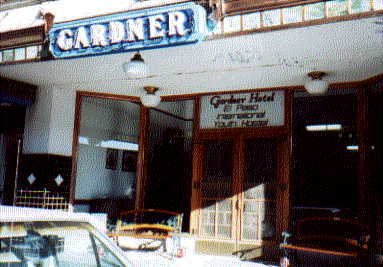 Above: Front door to the Gardner Hotel & Youth Hostel in El Paso. After leaving the Comanche Motel & Hostel, I drove up through the Davis Mountains. Stopped and toured the McDonald Observatory. Then drove to Marfa to see the Mystery Lights. I had first heard of the lights on one of those "That's Incredible" programs. Never thought I'd actually be here--right in Marfa, Texas! But here I stood! Anyway, I arrived at 2pm. It's a very small town. I found a somewhat vacant open field with a "Camping" sign on it. I went to the nearest house and knocked on the door. No answer. Walked around. Couldn't find anyone. Drove around town. Sign in the museum door said, "Open Tuesdays". Well, it wasn't Tuesday. So I had to find something to do from 2pm 'til 9pm. 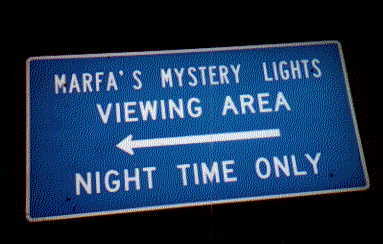 (because I couldn't go to see Marfa's Mystery Lights until after dark). Drove to the next closest city--Alpine, Texas. I enjoyed looking at and being amazed at the landscape. I've seen plenty of mountains, but I've never seen so many different kinds of mountains until I started on this trip. Here, between Marfa and Alpine were big, brown & gold, rolling, treeless mountains. I was tempted to get out of the car and climb up one to the top. But I had shorts & sandals on and thought I might step on a rattlesnake or something. Alpine is much bigger than Marfa. First thing I did was to find a nice, cool restaurant to go to where I could "soak up as much coolness as possible"! Had something to eat. Drove around Alpine. Found the Sul Ros College & sat in their library writing letters, catching up on my journal entries, and drinking an icy cold coke. Below: Contents of a flyer put out by businesses of Marfa concerning the "Marfa Lights". The Ghost Lights of Marfa still shine as bright as ever, and are as mysterious as they were when they were first seen by early settlers who drove their through the Marfa area in 1883. A Marfa Lights viewing site has been provided for the public on Hight way 90 by the Texas Hwy. Dept.. It is located nine miles east of Marfa. Ghost Light watchers can go to the area and scan the south western horizon looking for Chinati Peak. Using a red tower light as a morker, one can know that any light to the right of the marker that appears and disappears, is a Marfa Ghost Light. You will know them when you see them. There is no mistaking them. At 9pm I was standing there at the designated "Marfa Light View Site" along with about a dozen other people. Half of us had binoculars--we shared with those who didn't. "Ohhhh, there's one! Do you see that?" "Look over there, there's a white one!" "Wow, that one's getting bigger & smaller!" "There's another one!" It was a good time. Some people stood on rocks to get a better look. I think I had more fun watching the people! The whole thing was pretty fun. By the time I decided to leave it was close to 10 pm. I thought about just curling up in the car right there on the side of the road to get some sleep. Well, it was a thought. The closest hostel was in El Paso--that was 195 miles away. Drove down the street and called my son & his girlfriend to say "Hello" and to let them know where I was and where I was headed. Then started driving down Route 90 toward El Paso. I knew it was going to be a long night. I wished I could have driven during daylight so I could see what the surroundings looked like. But it was pitch black. No lights whatsoever except my car headlights. A car or truck drove by about once every half hour or so it seemed. I couldn't see anything except the road ahead of me. Can't remember ever seeing such total blackness! Whoa! A deer bounded out in front of my car! Just missed it! Phew! A couple of hours and I'll be nearing El Paso. I noticed a light in the sky to my right. I figured it was a beacon on top of a hill somewhere ahead. It was there for awhile. I didn't think much of it. Then it moved. So I knew it wasn't a beacon on a hill. Maybe it was a satelite that just looked like it had been stationary because it was coming in my direction. It was moving very slowly. Then it stopped. Well, it was not a satelite. I pulled over to get a look at it. It was a cluster of twinkling lights. I drove further up until I was right under them. I got out of my car to look at them. They must have been way up 'cause I couldn't hear any noise from it. I got my binoculars out. They were a group of closely clustered lights that seemed to blink on & off in a series. Flashing. I couldn't tell what shape it was. I would have taken a picture, but a flash camera is useless for faraway night-time pictures. It was unusual. 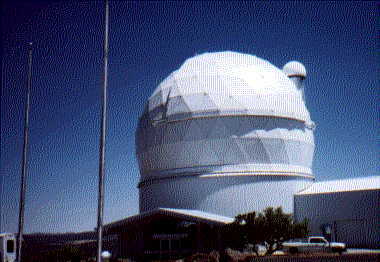 But I figured that if it was anything really weird, then the guys at the McDonald Observatory would have seen it. I could have stood there all night watching them, but I didn't feel comfortable standing there outside my car in the pitch dark in the middle of no where. I didn't know if snakes, scorpions or big spiders come out on the highway at night or not. Plus I could think of many reasons why I shouldn't be standing there. My imagination is too good. And I had a long way to travel. 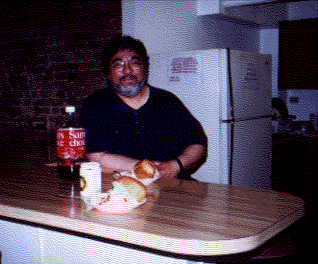 George made dinner & invited me to eat with him on the first day I arrived. A native of El Paso, he spent 3 yrs. in the military at Pease Air Base in New Hampshire. That's not far from where I live. He showed me around El Paso. I volunteered to make dinner for him & Yoko the next night. Drove all night to the outskirts of the city. Pulled into a rest area around 4 am to try to get a couple hours sleep. It was too early for the hostel to be open. Frazzeled, I found the hostel at 7:30 am. Jumped in the shower and settled in to get some sleep. Then I met my room mate, Yoko from Japan. She spoke very little English. The hostel manager explained to me that she wanted to know if I would rent a car with her to drive to White Sands, NM. She'd always wanted to see White Sands. To make a long story short--I didn't get any sleep. Oh well, I wanted to see White Sands too. 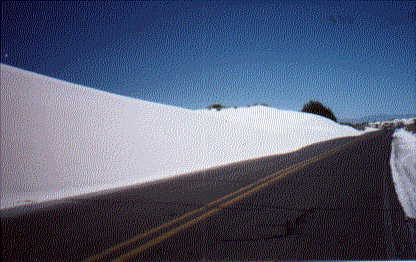 We took my car and drove to White Sands--I had no idea that it was almost 100 miles away! 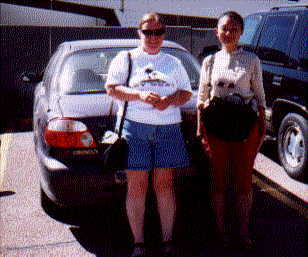 Above: Yoko (hosteller from Toyko, Japan) & me getting ready to drive to White Sands. The next day, Yoko & I took the trolley to Juarez, Mexico. 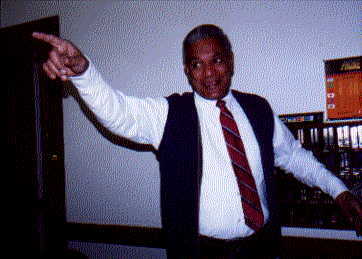 Then visited George at the office where he worked. He took us on a tour of the area. Hostel within the historic 50 room hotel. Ten rooms are set aside for the hostel. Two bunks in each hostel room. Kitchen, laundry, storage, pool table, TV room.